Two Rivers Community Development Corporation, a non-profit located in North Bend, has created a new company called Native Sports to officially partner with Baden Sports Inc. in a new venture designed to empower Native youth through sports and business. 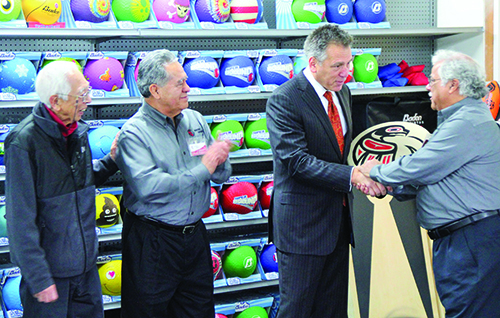 The partnership also hopes to change the landscape of sports balls used on reservations across the country by providing exclusive tribal designed, top-of-the-line basketballs and footballs for play at all levels. Native Sports and Baden Sports formally launched their partnership at the first Native Sports Youth Development Summit held at Baden’s headquarters in Renton on November 21st. Native youth from the twenty-nine tribes in Washington were invited to participate. Attendees learned about the newly formed Native Sports group and how they as youth can become involved in the organization. Baden representatives provided product overviews and demonstrations, including balls engraved with the Native Sports logo. Proceeds from Native Sports will be used to further educational, athletic, and social development of Native American youth. Among the Youth Development Summit attendees were several members from Puyallup Tribe’s Youth Council and representatives from Muckleshoot. 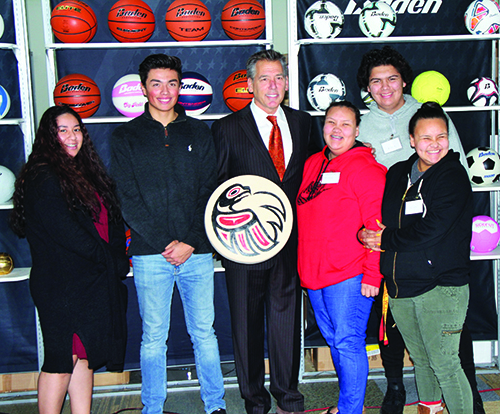 After listening in detail to how they could join the Native Sports business venture, the tribal youth got to meet Baden Sports Vice-President, Jake Licht, and then received a surprise meet and greet with Seahawks legend, Jim Zorn. This entry was posted in News, Sports, Tulalip News and tagged Baden, Native Sports, Native Youth, Two Rivers Community Development Corporation by Kim Kalliber. Bookmark the permalink.